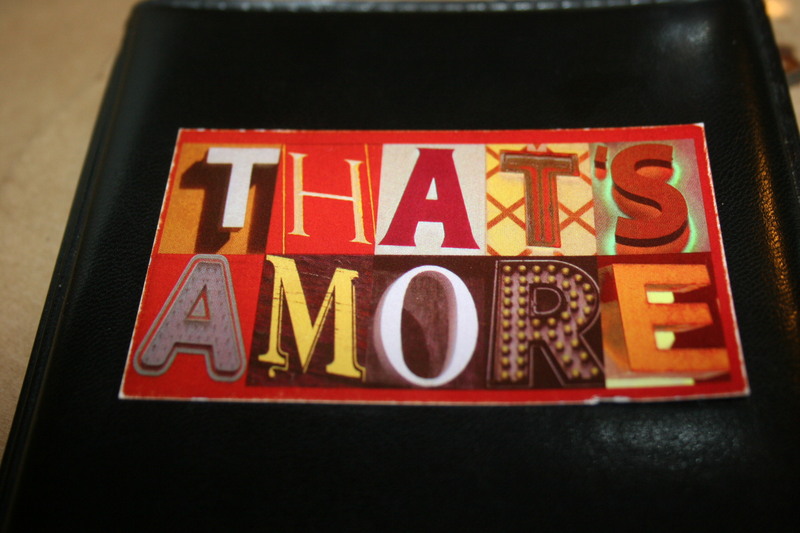 Six of us head to That’s Amore on Valentine’ s Weekend foolishly thinking that “Amore” means “Love”. 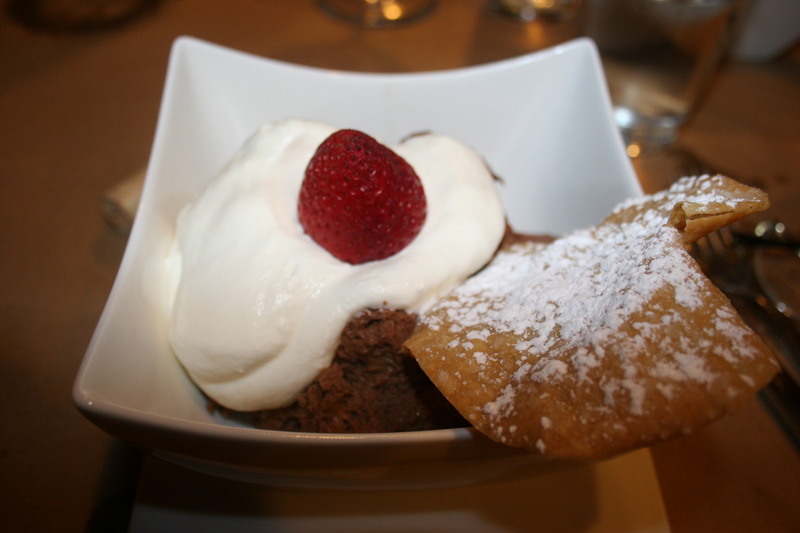 We discovered that what That’s Amore really means is FOOD….lots and lots of FOOD. It may have been our fault for spotting the Chef’s Table portion of the menu. We had been here in early December and enjoyed a really good meal but didn’t realize that they offered a Prix Fix section where you get five courses for $25.00 and several more courses (an endless parade of courses may be a better description) for $35.00. We all opted for the $35.00 selection. Before we get to the onslaught of delectable goodies that this choice brought about, here are my wines for the evening. 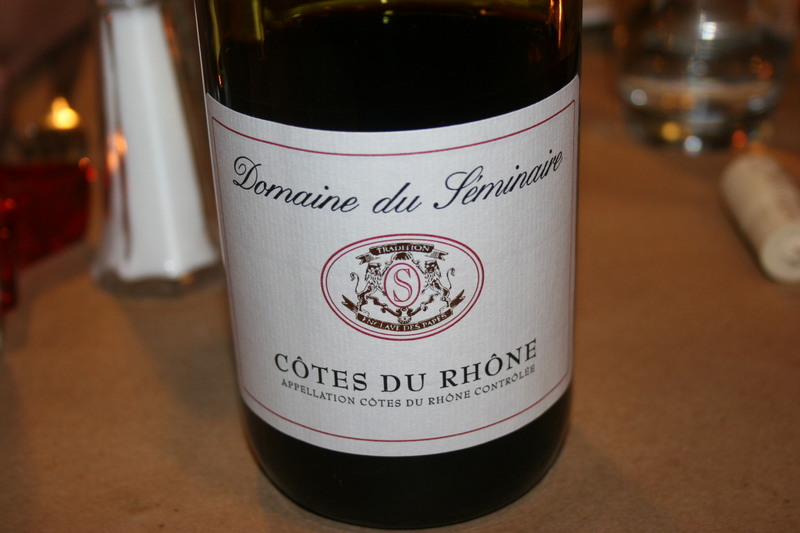 My first wine was the 2008 Domaine du Seminaire, Cote Du Rhone. This was a Moore Brothers featured wine a couple of weeks ago and it’s a very nice value at $11.00. You will never confuse this with a $100 bottle but it delivers nice berry flavors in a well-balanced wine. 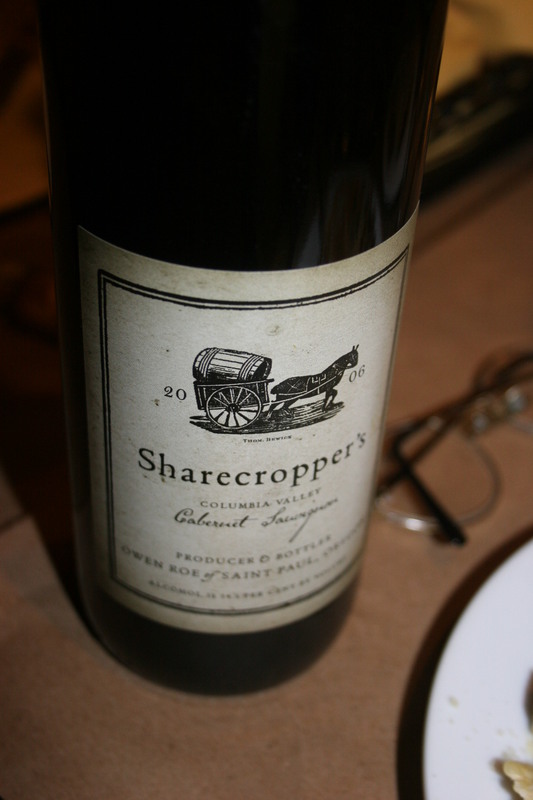 I usually bring a second bottle but seldom open it but the abundance of food on this night had us popping the 2006 Owen Roe, Sharecropper, Cabernet Sauvignon, Columbia Valley, Washington. Not a great cab but it was certainly drinkable. I think this producer does a much better job with their Oregon Pinot Noirs. And then came the barrage of food……. 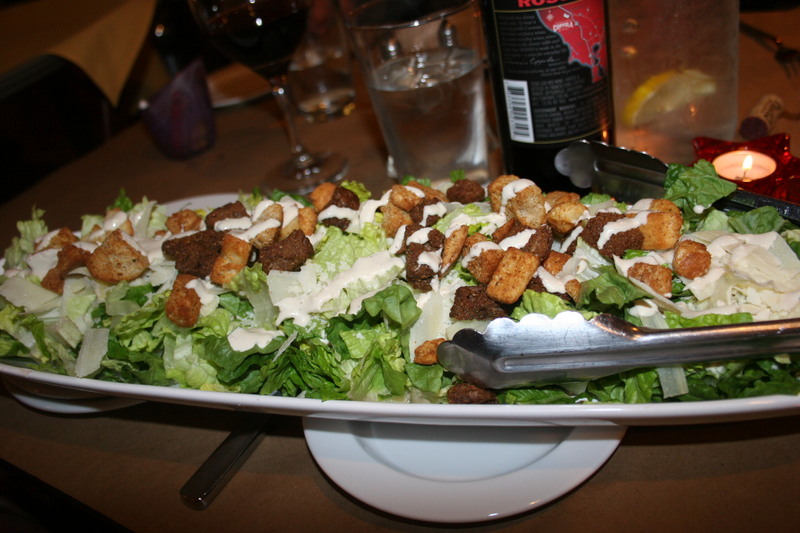 The House Caesar Salad, piled high on a small boat. 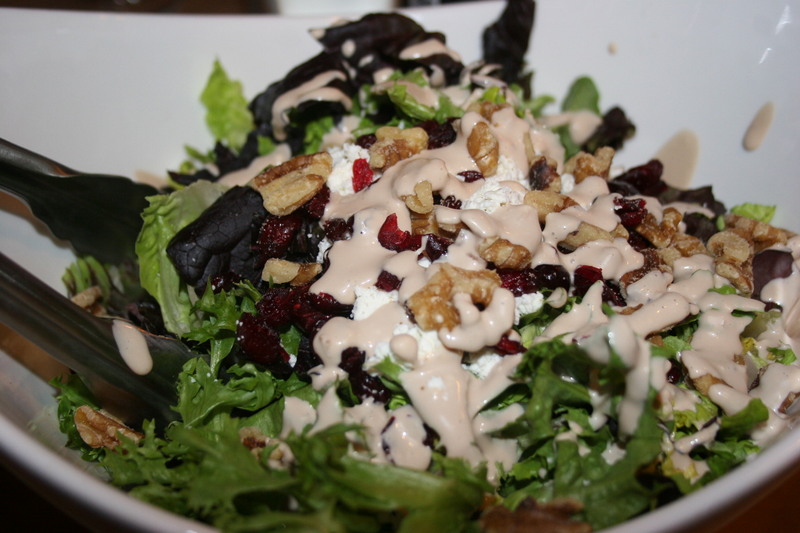 We each filled our plates with this one as we alternated quickly between the two salads. 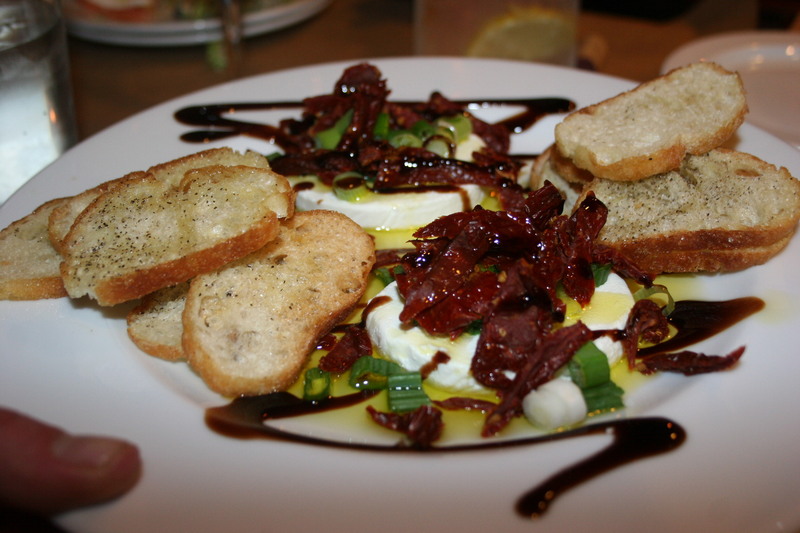 We evidently were not quick enough because before you could say, “I wish I had some tomatoes to go with this”, we were presented with…..
the Pillow of Goat Cheese, this one was accompanied by some sun-dried tomatoes and a balsamic topping with crispy slices of crostini on which to spread the toppings. This was a flavorful dish but I was ready for some hot stuff. 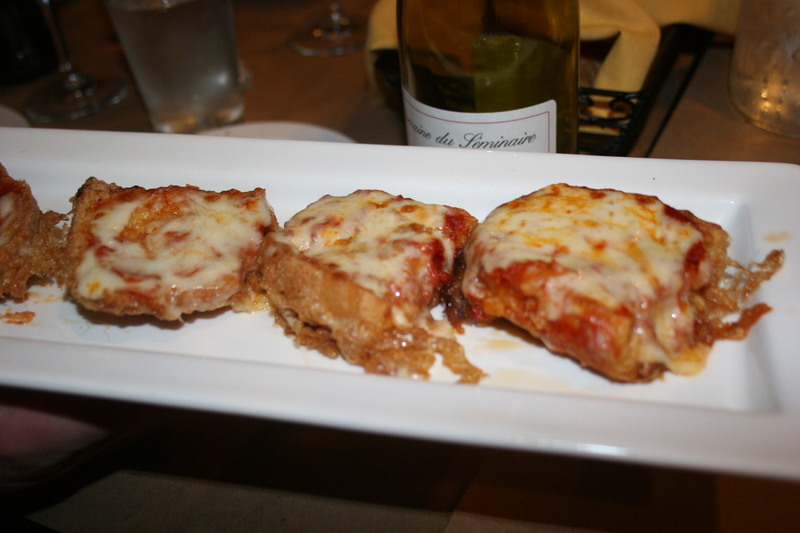 Fried Pizza, This dish was actually twice as big as the picture and I couldn’t get all six pieces into the frame. Hey, what could be bad about fried pizza? In this case, nothing, it was delicious and this one disappeared from all six plates very quickly. We took some time between courses to chat with our server, Tom, who really was kept busy the entire night as the restaurant was quite crowded. 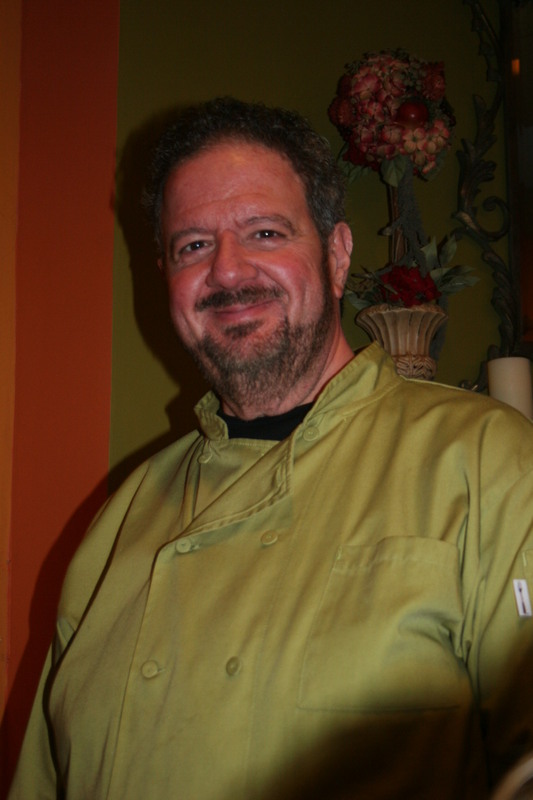 We also spoke with Chef/Owner Alfredo who now on both of our visits has ventured out of the kitchen to welcome us and inquire as to how everything was. I think this is an important quality in a chef that he mingle with the guests and hear feedback both good and bad, To me, it’s an indication that the restaurant cares about what it is serving and wants your return business. 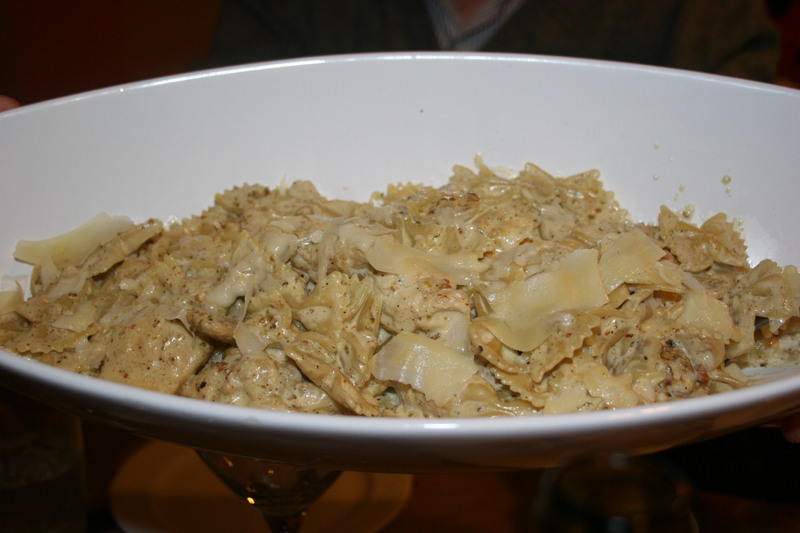 Our first entree was chicken with bow tie pasta in a pistachio cream sauce. The pasta was nicely done and each morsel of chicken was flavorful. The light sauce was an excellent choice in completing the dish. 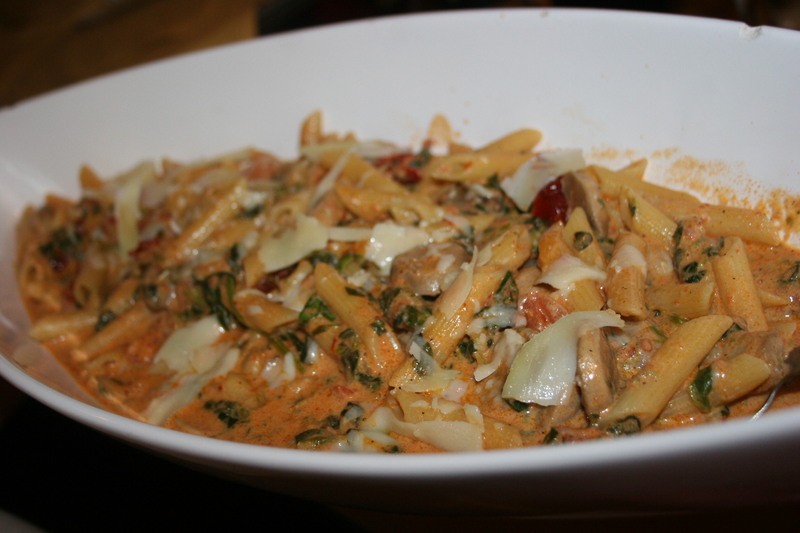 If the chicken and bow tie pasta wasn’t your thing then you could leave room for the Penne in blush sauce with veggies. It sounds simple but it was a nice addition to the meal. The sauce was great and the pasta, once again, cooked to perfection. 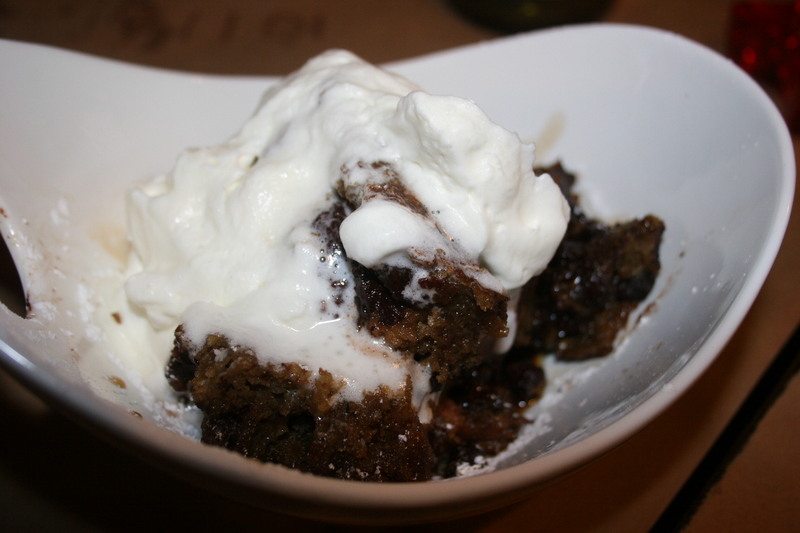 Each of us loosened our belts a notch and prepared for yet another entree. This next one was…. 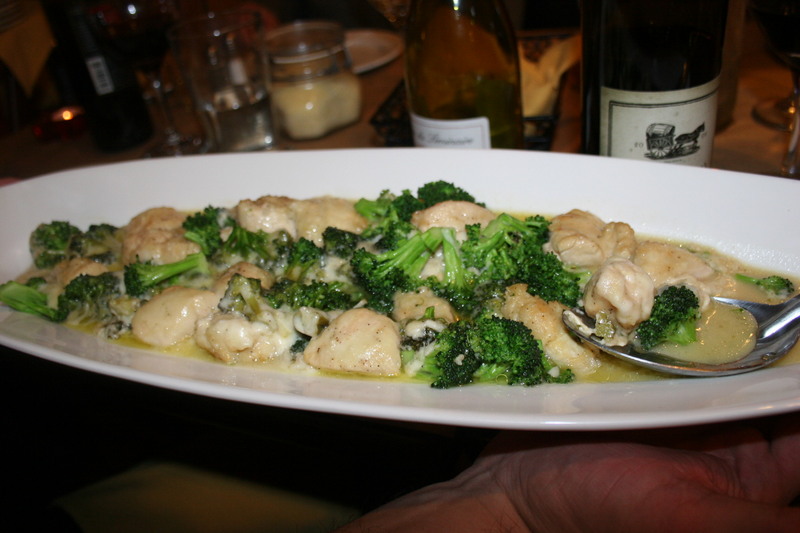 Chicken and Broccoli in a Lemon Butter Sauce. I’m pretty sure someone in our group made some slight change request to what was originally being offered but I liked this dish so I am not complaining. Some did mention that the chicken had been over-salted but it certainly didn’t ruin the dish. Alfredo apologized and offered to replace it but that was hardly necessary. The last entree of the evening was the fish. It is usually shrimp done in one of several different ways but we had a shellfish allergic in our midst so they substituted…. 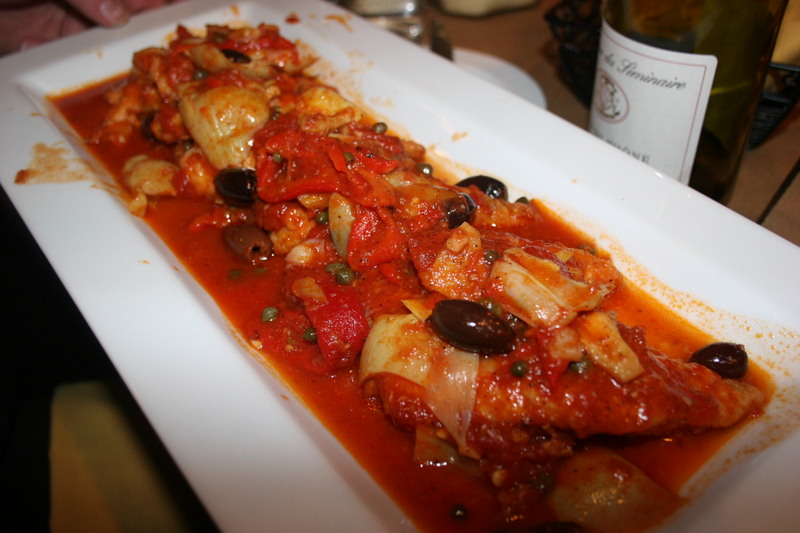 Tilapia Puttanesca, topped with olives and capers and served in a rich, red sauce. 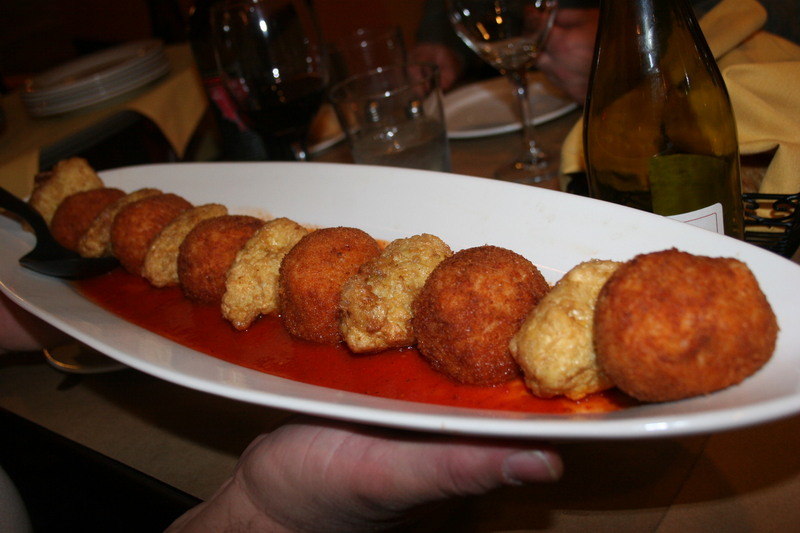 This was a very good dish and a nice contrast to the chicken and pasta courses. It was hard to believe that any of us had room for dessert but I guess we wanted to make sure we had sampled everything so out came…. Quite honestly, I’m not even sure exactly what the desserts were. 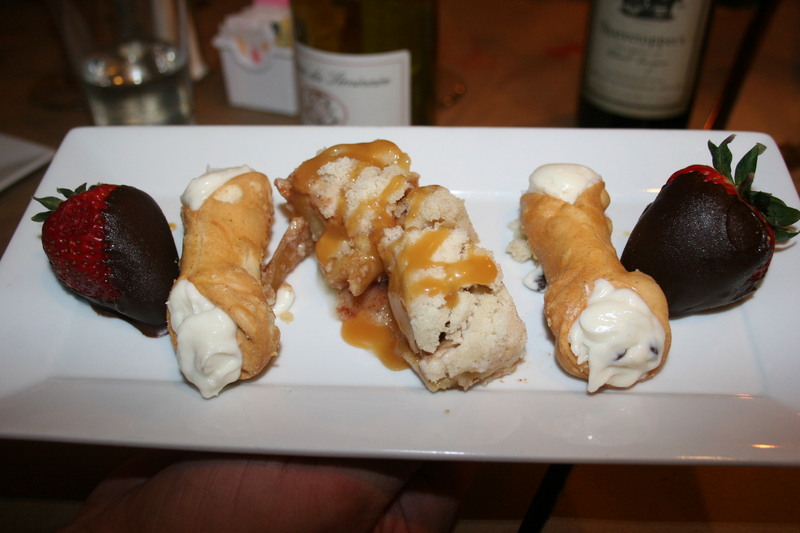 There is chocolate, whipped cream, some cannoli’s, a little caramel something. They were good and none of us exploded so, that’s a good thing. When we first arrived the noise level at That’s Amore was almost deafening. 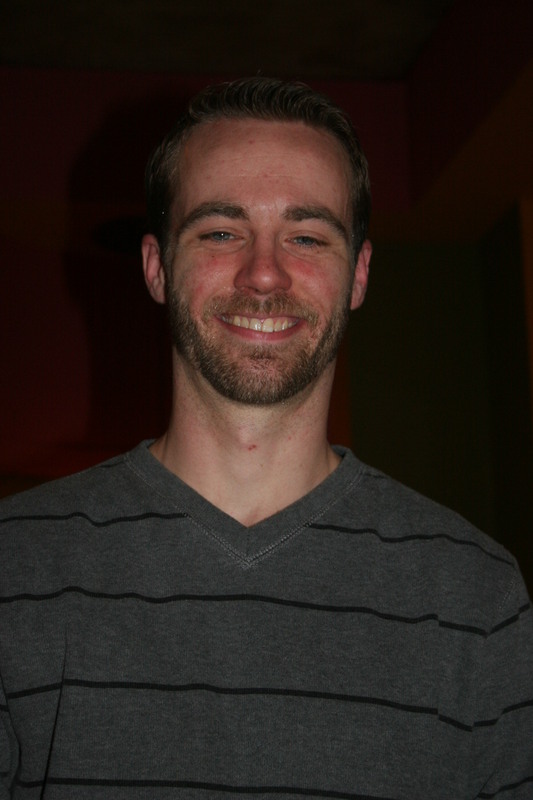 I virtually could not hear Tom recite specials and I was two feet away from where he stood. As the evening progressed, the noise level became much more bearable. 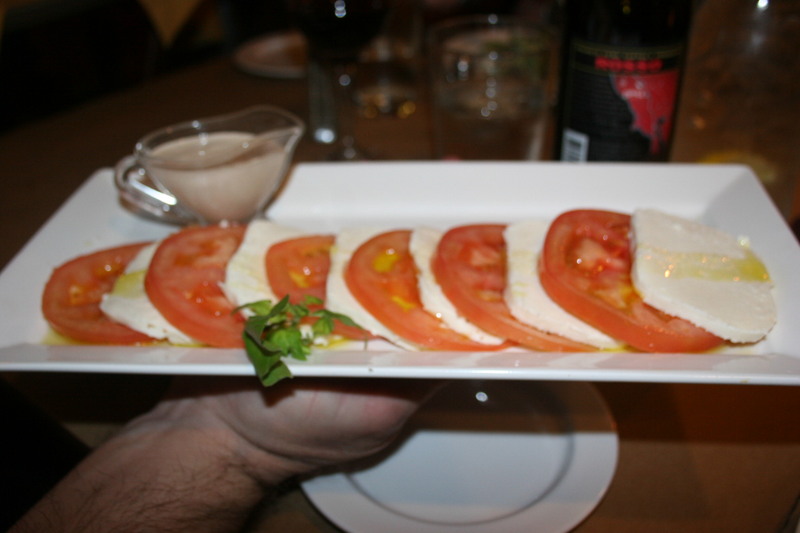 The Chef’s Table at That’s Amore is an excellent value. I do have to warn you that the amount of food served would provide a great meal prior to sending out an army to do battle with hordes of invading warriors. However, you would be wise to put your money on the invading warriors, as the over-fed army would be in no shape to fight; but don’t take my word for it, make a reservation and find out for yourself.